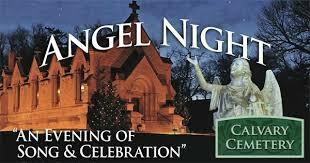 The Chorale will be performing at ANGEL NIGHT, a free, family friendly event. Walking and riding tours of illuminated angel statues. Music in the historic St Henry Memorial Chapel. Cookie decorating. Children’s craft area. Refreshments.An evening of song and celebration. All parking on cemetery grounds.